LONDON (AP) — Arsenal strikers Pierre-Emerick Aubameyang and Alexandre Lacazette both scored in the second half to give the Gunners a 2-1 win over Cardiff in the Premier League on Tuesday, in the visitors' first game since the plane carrying record signing Emiliano Sala disappeared last week. 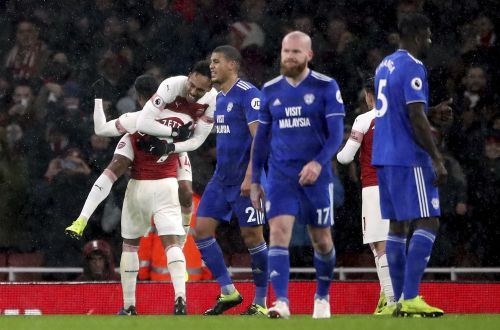 Aubameyang's penalty gave Arsenal the lead in the 66th minute and Lacazette doubled the advantage with a well-taken solo goal in the 83rd, before Nathaniel Mendez-Laing pulled one back in injury time for Cardiff. It was an emotional game for Neil Warnock's side, as the missing Sala and pilot David Ibbotson were remembered throughout a somber evening in north London. Two days after Sala's transfer to Cardiff from Nantes, the small passenger plane carrying the Argentine striker and Ibbotson disappeared over the English Channel. "We spoke about it before the kickoff: for Emiliano we ought to try to put a performance in," Warnock said. "I can't explain how it's been this week. You've not really wanted to get out of bed, because you know what's coming. Everything was really miserable. Nobody could actually do anything about it. In the circumstances, we've only worked on it for 24 hours, the system and everything. They couldn't have given me any more tonight. I'm proud to be their manager tonight." The away fans held up a large banner reading: "We never saw you play and never saw you score, but Emiliano our beautiful Bluebird we will love you forever more." Warnock had described the past week as "by far the most difficult" of his 40-year career in management, but it was actually the visitors who had the better first half. Bobby Reid had two good chances to put Cardiff ahead but he shot just wide after Mohamed Elneny failed to control a bouncing ball, and then headed over from Callum Paterson's cross. Cardiff also wanted a penalty when Oumar Niasse went down in the box between Nacho Monreal and Sead Kolasinac, but referee Mike Dean dismissed appeals. Arsenal's attacking play was disjointed throughout most of the evening, in part because of an incessant cold rain that turned into snow in the second half and in part because the decisive pass, touch or cross was repeatedly missing.